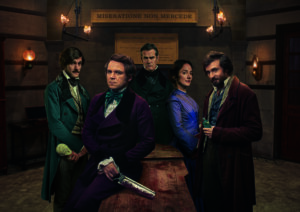 Quacks is a new six-part BBC Two comedy series and follows William, a young psychiatrist, (Mathew Baynton), Robert, an egotistical surgeon (Rory Kinnear), and John, a hedonistic anaesthetist (Tom Basden) and their comedic misadventures during the early days of modern medical science in the 1840s. The impressive ensemble cast includes Rory Kinnear (Skyfall, Quantum of Solace, The Imitation Game), Mathew Baynton (Peep Show, The Wrong Mans, You, Me and the Apocalypse) Tom Basden (Plebs, Star Stories) and Lydia Leonard (Da Vinci’s Demons, Whitechapel), with a guest performance by Rupert Everett (Stardust, St. Trinian’s, The Musketeers) as Dr. Hendrick. The highly popular Historic Chatham Dockyard, Kent doubled as streets of Victorian London. It was also used as the location of the market place, the apothecary and bareknuckle boxing fight featured in the series. The Historic Dockyard Chatham has previously been used as a filming location for a vast range of productions such as Close to the Enemy (2016), Mr. Holmes (2015), and Arthur & George (2015) with the over a hundred Georgian and Victorian buildings and cobbled streets making it a popular choice. The new series of Quacks starts on Tuesday 15th August on BBC Two at 10pm. This entry was posted in Filmed in Kent and tagged BBC2, Historic Dockyard Chatham, Quacks, Rory Kinnear. Bookmark the permalink.